Senate candidate Mitt Romney, in a Utah debate Tuesday night, criticized the Trump administration's zero-tolerance immigration policy that led to the separation of families at the border, calling it "a heartbreak" and "a dark chapter in American history." "This is inexcusable and can't go on," Romney said. Trump signed an executive order in June to end his administration's policy of separating families who crossed the border illegally, instead opting to detain parents with their children. A federal court has ordered the government to return more than 2,000 detained children to their parents. More than 200 children have yet to be reunited. 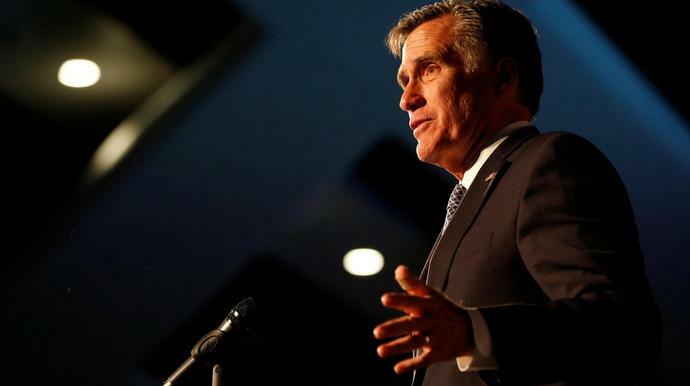 Romney, a former Massachusetts governor and 2012 Republican presidential nominee, faces Democratic opponent Jenny Wilson, a Salt Lake City councilwoman, in the November general election. The seat was left vacant by retiring Sen. Orrin Hatch, a fierce supporter of President Donald Trump and the longest-serving Senate Republican. Romney and Wilson sparred on a number of issues, including immigration and gun laws, at Southern Utah University in their first and only debate ahead of the midterm election. Romney said he supports securing the U.S.-Mexico border and that the 1.8 million undocumented young people who came to the U.S. as children, better known as Dreamers, should be able to stay in the country legally. "I also believe that if they want to become citizens that they should have the opportunity to get in line with everybody else," he said. "No special pathway, but get in line." Wilson said it's time for "comprehensive, compassionate and family-centered" immigration reform. And she blasted Romney for being "more hawkish" than Trump on the issue. "I find it heartbreaking," she said of the Dreamers. "To think that we would have them stand in line ― they did not come by their own volition ― and wait isn't OK."
Romney announced his bid for the Senate in February and quickly earned an endorsement from Trump, despite the two's colorful history. Romney was an outspoken critic of Trump during the 2016 election, dismissing the then-candidate as a "phony" and a "fraud." He also said Trump was "playing members of the American public for suckers" and that his "promises are as worthless as a degree from Trump University." Trump wasted little time swinging back, saying Romney "choked like a dog" during his 2012 presidential bid. Romney and Trump later discussed the possibility of Romney becoming his secretary of state. During Tuesday's debate, Romney dodged questions about his previous barbs against Trump. He said he agrees with many of Trump's actions, including the administration's deregulatory push and his rollback of national monuments in the state of Utah, but that there have been times that the president has said things that Romney found "divisive or racist or misogynistic." "I will speak out about those things," he said. "I don't want to become a gadfly, talking day after day about everything that the president says day to day. I don't always agree with what he says." Asked specifically what Trump had done to redeem himself, Romney said, "I'm not going to characterize specifically my comment in that regard in the past. I'm going to talk about the future." At least twice Wilson referred to Romney as "multiple choice Mitt," criticizing him for flip-flopping on issues during his political career. The first came after Romney said he opposes new federal gun regulations, arguing that states should be able to make those decisions on their own. Wilson responded by reading a statement Romney made upon signing a state assault weapon ban in 2004 while governor of Massachusetts: "Deadly assault weapons have no place in Massachusetts. These guns are not made for recreation or self-defense. They are instruments of destruction with the sole purpose of hunting down and killing people." Wilson also noted that Romney had voiced support for the federal assault weapon ban in a 2008 presidential debate. "I do support strengthening our gun laws," she said. "Hope and prayers are not enough with the terrible devastation we're seeing in schools." After failing to secure the Utah Senate Republican nomination outright, Romney cruised to victory in Utah's GOP primary in June, easily defeating state Rep. Mike Kennedy. He's a heavy favorite over Wilson in the Nov. 6 election.